The project launched on 23rd June 2016 at the NCAD Graduate Show where the participants initially met with Carrie-Ann Moran from Rediscover Fashion and artist Sinead McDonald, the facilitators for the Creative Lab. The participants were then given a guided tour of the graduate exhibition to inspire creativity and to help raise awareness of the use of materials, conceptual and artistic expression, as well as design sustainability. It also allowed them to explore their options in further education. 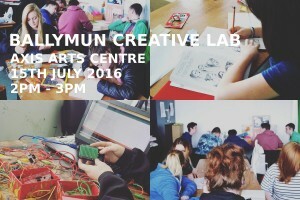 From July 4-15th, the 15 teenagers from 7 schools will work with a team of artists, designers, sustainability experts, and film-makers in the Creative Lab located in the Axis Arts Centre. This community-based learning project will teach creative exploration and conceptual expression while delivering valuable transferable knowledge and skills, such as upcycling, multi-media, photography, fashion design, art presentation and exhibition curation. Significantly, 2016 is an important year for Ballymun, marking not only the national 1916 Centenary but also the 50th anniversary of the Ballymun flats complex. The Axis Arts Centre will respond to these events through their visual arts programme, showcasing work that engages with issues of memory and archive. The theme for the 2016 Creative lab, Past, Present, Future, also reflects these occasions and this context combined with the concept of zero waste will create innovative project outputs. Additionally, the theme resonates with the current refurbishment of the Ballymun Boiler House under the Rediscovery Centre’s WISER project, turning an iconic structure of the past into an education centre for the circular economy of the future. The participants’ artwork will be displayed at a showcase event in the Axis Arts Centre in Ballymun on July 15th and all participants will receive a Certificate of Achievement from the National College of Art and Design.